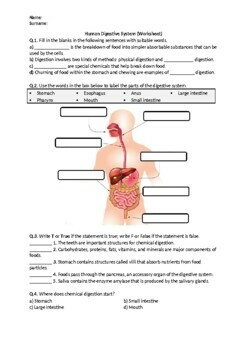 This worksheet contains basic conceptual questions about human digestive system. This worksheet contains different type of questions. True-false questions to examine common misconceptions. Fill in the blank questions to promote conceptual learning. Open ended questions to connect the scientific concepts with daily life examples. Human Body Systems Worksheet Bundle.